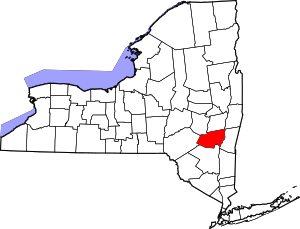 This is intended to be a complete list of properties and districts listed on the National Register of Historic Places in Greene County, New York. The locations of National Register properties and districts (at least for all showing latitude and longitude coordinates below) may be seen in a map by clicking on "Map of all coordinates". Two properties, the Pieter Bronck House and the Thomas Cole House, are further designated U.S. National Historic Landmarks, and the latter is also a National Historic Site. (#100001586) NY 81, Oak Hill Rd., Giles Ln. 42°10′30″N 74°01′12″W﻿ / ﻿42.175°N 74.02°W﻿ / 42.175; -74.02﻿ (Rowena Memorial School) Palenville Built early 20th century by local vacationer as gift to local community in memory of his wife; used through early 1970s. Wikimedia Commons has media related to National Register of Historic Places in Greene County, New York. This page was last edited on 31 March 2019, at 14:14 (UTC).